For my first post-wedding blog I thought I'd give you a shop review of the Kyles Collection store in London. After seeing their collections at both Asiana Wedding exhibitions earlier on in the year, and getting a chance to speak to the owner herself, they were my first choice when it came to picking my own bridal jewellery! Kyles have a number of stockists around the UK, and internationally (in Canada, South Africa and Spain) but I wanted to go straight to the source so visited their main showroom in London. I rang up a few days before to make an appointment for a bridal consultation and off I went. The store itself has a main showroom in addition to a more private "bridal lounge" downstairs, although on the day I attended it got a little crowded as there were quite a few brides + their entourages picking out jewellery. The owner, Nisha was very friendly and we had a little chat about which pieces I liked before trying some on with my the top of my wedding outfit. The first thing I told her was that I wanted a shingar patti (see hairpiece in photo below), which I'd seen on the catwalk and fallen in love with. The first time I saw a shingar patti and decided I wanted one! After choosing the shingar patti, Nisha worked her way down suggesting which earrings and necklace would complement the look. Once those were sorted I got a bit carried away and started to pick up all other kinds of jewellery pieces they had...at which point Nisha suggested 4 pieces would be enough (shingar patti, necklace, earrings, bracelet) - otherwise with my petite features I'd drown in it all! With all the designs chosen, colours and plating were next on the agenda. Nisha went through each piece noting down the colours I wanted each stone to be. I was very impressed with how thorough and professional the whole process was, it gave me a lot of confidence in that I'd be getting exactly what I had picked in store. If all of that wasn't enough to put a smile on my face, there were two more little things that made Kyles stand out from your average jewellery store. 1) I got a matching hair-slide for free because I had bought a 3-piece set. It wasn't intended to be worn on the wedding, but it was something I could wear with the jewellery when I wore it again afterwards. 2) The shingar patti was made in such a way that if I took it back to the store after the wedding, it could be turned into a necklace and a tikka. It took about 3 weeks for my order to be ready, and I was very pleased with what I received! Now for anybody who's a bit curious...here's a lil photo of my set - necklace and earrings in the box, armband on the left, hair slide on the right and shingar patti in the middle. I definitely didn't go for the traditional bridal look, and this should give you a clue about my wedding outfit! Kyles do have pieces that suit brides who want to go for a heavier more traditional look with their jewellery and the service you receive instore is exceptional! Kyles collection is 110% SCAM i BROUGHT MY BRIDAL SET FROM THEM.i came out in a rash on my weddding day. I Complained to a lady called Nisha she said made up with a load of rubbish sayin it could a number of factors skin types,creams etc I asked her is type of metal do the use she replied NORMAL NASTY CHEAP TIN! I £950.00 for TIN!!!!!!!!!!! 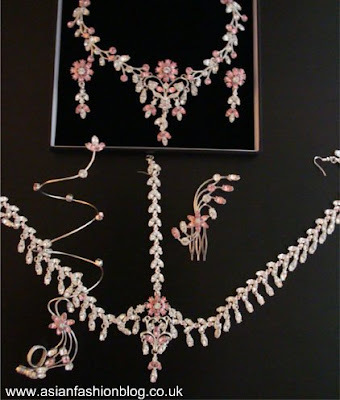 I've bought a number of products from Kyles - if you've read this blog post (which I hope you have instead of skimming to the end so you can leave your rant in the comments section) you'll see that I too bought my bridal jewellery from them. I have never experienced any adverse skin conditions due to wearing any products from Kyles and I have to agree with Nisha, the owner, that your rash could have been due to an allergic reaction or some other chemical reaction to a skin cream you were using. In regards to her reply of "NORMAL NASTY CHEAP TIN" I highly doubt that anyone would describe their own product as "normal" "nasty" or "cheap". This is from the Kyles Website: "We use tin castings and and copper alloy to make all our designer jewellery" so there is full transparency over what their products are made from. Considering you spent so much money perhaps you'd at least ask before you bought the items?? A very dramatic statement, I'm sure your jewellery was full of Swarovski crystals, which as you know aren't exactly cheap. I appreciate that you had a bad experience and some people may find your comments useful when researching Kyles, but as I said at the start - I disagree with you. But the lady who said whom got a reaction, i have to agree with her. Same thing happened to me, my ears became so sore because of the earings! I was appalled......Ive always wanted to buy Kyles set even tho it was way out of my budget but but hey i got it anyway and didnt care about the price. I work within the fashion industry and something i discovered was that their sets are arnt worth 500 pounds! more like 100! I was shocked to find out these revelations.....but whos going to believe me anyway since Kyles are "amazing" when they are not! This is just my personal opinion and wanted to share with others as i came across this topic!